We’re #88! How About You? This week national news outlets have taken note of Outreach Magazine’s lists of the ‘Top 100’ largest and fastest growing churches in America. We’ve gotten quite a bit of mail due to the fact that Clear Creek Community Church is in the latter list. 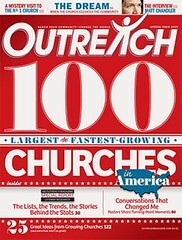 According to Outreach Magazine, we are the 88th fastest growing church in America. Let me be the first to say we’re a little bummed in the land of the four C’s because we really went into 2010 shooting to be the 87th fastest growing church in America. While we’re incredibly devastated about our inability to get the spot we really coveted. We promise to do our best in 2011! For now, however, I guess we’ll have to let go of some staff we think were probably holding us back from getting 87th and return to the drawing board. “87 in ‘11” does have a nice ring to it though! All joking aside, what do we think about this list and our place on it? Frankly, we knew nothing about it. However, with people assuming what being a fast-growing megachurch means (both positive and negative, depending on what blog you read…which I found is mostly negative), I thought I’d weigh into the fray by sharing what being #88 means to me. It reminds me that I, and the leadership of the church, have a huge responsibility to steward the people God has given to us. And that no matter how much notoriety we may get for the growth we experience, in the end, this should always be about Jesus and the goodness of his Gospel. We will fail miserably if it becomes about us. It encourages CCCC to do our best to help people become fully devoted followers of Jesus Christ and do it in a way that those outside our fellowship won’t accuse us of having a mercenary relationship with the congregants. We should continue to be transparent, above reproach, and even over-communicate the ‘why’ behind our decisions to avoid as much misunderstanding as possible (even though it’s inevitable to some degree). It intensifies the good burden of living with integrity amongst the community where we’ve been planted. With greater exposure, a large church often provides a greater risk to the wider Body of Christ, knowing that if we blow it, CCCC doesn’t just take a hit but churches around us will likely be unfairly thrown in the mix as well. Did you hear about CCCC? I tell you, all the churches are the same… This only increases the weightiness of honoring Jesus in all things. It calls me to continually depend upon God’s grace. Large churches aren’t automatically good or bad, but some can get hoodwinked into thinking that if a lot of people are coming to your church, you must be doing things right. But that’s not true! Man can grow a church numerically, but only God can grow a church spiritually (cf., 1 Cor. 3:7). Who really cares if your church is packed with people but you’re not helping them embrace and live out the Gospel? Being recognized as a fast-growing church plants the sobering question in me: What is your confidence in – the Gospel or something (anything) else? Is this about you or Jesus? In the end, being #88 on a list someone printed up in a magazine about fast-growing churches really isn’t something which concerns us because it doesn’t mean anything definitively. It doesn’t tell people whether we believe the Gospel, seek to help people find God, raise up leaders for Christ, minister to the brokenness around us or that we’re committed to the mission of planting churches around the world. I believe those are more noteworthy elements for the church, but being #88…well…it just reminds me all the more that I should be about the business of things magazines usually don’t have lists for. 87 in ’11 does sound cool though, right? 4 responses to We’re #88! How About You? Focus on this, and the following points will take care of themselves. We have no higher calling than to love the Lord, and love our neighbors. Just like He said in Matt 6:33. It’s not about the size (or growth rate) of the church. What matters is the heart that beats within. Keep Christ as the head, and everything will be fine in the end. The only place where it matters being recorded is in the Lambs Book of Life. Rest is just window dressing.